Eighty-two years after the original development of the four stage Demographic Transition Model (DTM) by the late demographer Warren Thompson (1887-1973), the cracks are starting to show on the model that for many years revolutionised how we think about the geography of our global population. Thompson’s achievement was an important one. He suggested that we were in the midst of a transition, from an ‘old’ world dominated by high mortality, autocracy and subsistence to a ‘new’ world characterised by low mortality, democracy and an ever globalising economy. Our global society, slowly but surely, was moving to what he described as a ‘stage 4’ of the DTM: an earthly paradise in which mortality, fertility and population growth are low. However, is this really paradise? Is it too early to pop the champagne and congratulate ourselves for thousands of years of social and economic development? Is this the end of the demographic transition? The mainstay of the geography classroom in secondary and tertiary education is the 4 part DTM. 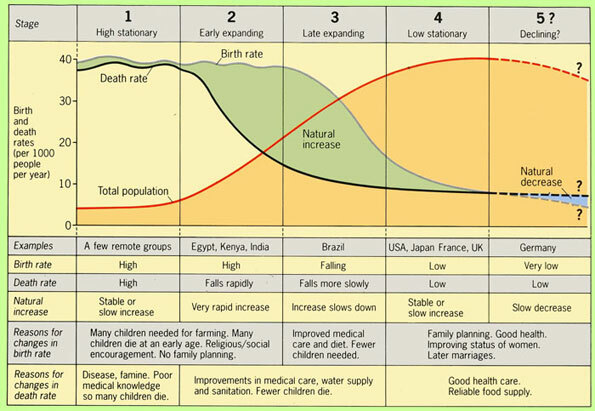 Its theoretical representation shows a graph whereby high and fluctuating birth and death rates dramatically decline in stages 2 and 3 and come to equilibrium in stage 4 whereby birth and death rates are low. Simultaneously intertwined in the graph is a line representing population growth rates which starts low, increases exponentially and levels off in stage 4. Today we may be entering the next and largely unanticipated stage of development. Countries of the developed world have long said farewell to times where woman used to be chained to an animal cycle of reproduction and death used to be an almost daily occurrence. We may need to ask: is stage 4 really sustainable in the long term? Are we still in transition? The developed world is now one that experiences a low death rate and therefore an aging population, a birth rate far below the replacement level and a flat lining of population growth. I would by no means be the first to suggest we may be entering something what would be best defined as stage 5. The three main indicators of stage 5 of the DTM are: a very low birth rate, a low death rate and a slow decrease of the total population. How is this different from stage 4? The birth rate is the lowest the human race has ever experienced and for the first time since the Stone Age (excepting medieval plagues), the total population of some developed countries are in decline. Does Stage 5 exist anywhere? Firstly, a distinction needs to be made between the old world, the new world and the whole world. The ‘old’ world simply refers to the relatively undeveloped world characterised by high birth rates and a predominantly agrarian economy. Examples include Zambia and Uganda, places sitting at around stage 2 of the DTM. The ‘new’ world refers to the developed world of places which include East Asia, Europe, North America and increasingly parts of the developed world, notably China. Much of the developed and developing world has already reached stage 4 and many countries are headed decisively into stage 5. The most startling example of the exhaustion of stage 4 is Russia’s recent demographic performance. Since the breakup of the Soviet Union, Russia has lost 5.7 million people through higher death rates and lower birth rates. This is equivalent to the emptying of Scotland and the city of Newcastle-upon-Tyne. The rest of Europe is seeing below replacement level fertility rates. The only phenomena sustaining the level of population in these countries are the diasporas of overpopulated Africa and Asia. Not only has Europe entered stage 5 of the demographic transition, it’s now facing the challenge of its related social issues*. What might a stage 5 world look like? Some current trends lead to some fascinating projections of the future demographic make-up of the most technologically advanced factions of our global society. The low birth rate, especially in Europe, has allowed for an empowerment of women unseen before in history. Many are essentially swapping children for careers. This financially advantages both the parents and the 1 or 2 children who can enjoy a healthy share of the family income. Another dimension to a ‘stage 5 family’ is the inter-generational relationships between 3 and sometimes 4 generations of a single blood line. 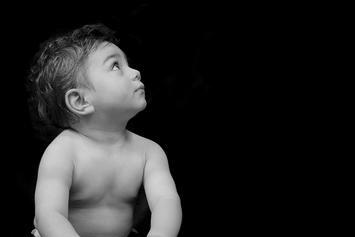 That is to say, it creates a situation where a grand child can have a relationship with a parent, a grand-parent and sometimes even a great grand-parent thanks to longer life expectancy and low death rates. This of course is rare in the ‘old’ world where a child may never know a grandparent beyond childhood. The reader may care to notice that this particular geography of the family, a 1 or 2 child household with living grand-parents, is not all that unusual. The decline of fertility in Europe has reached a point where it is below the replacement level needed to sustain the population. The reason that the European population is still growing, albeit slightly, is because of the influx of immigrants. The resulting greater multiculturalism can strain the patience of the most liberal and tolerant of people. It is a well known script from social scientists that immigrants tend to form insular communities in their arrival destination. The conflict between the British far-right pressure group, the English Defence League and British Muslims provides a textbook example of problems that arise from the ever evolving demographic transition. Problems that are of such importance, they are often reflected in the make up of parliament. Clearly, Thompson’s 4 stage DTM is increasingly outdated in most developed parts of the world. One possible solution to the dilemma of lost identity, rapid aging and depopulation may be a policy aimed at reversing the negative correlation between economic development and fertility. Mikko Myrskylä, Hans-Peter Kohler and Francesco C. Billari published an article in Nature 36 months ago outlining an irregularity in one of the most established relationships in the social sciences. Although it is normal for fertility decline in medium to high-HDI countries, there is evidence for fertility increase in areas of very advanced human development. Perhaps it is this that could serve as a new model of what might be called ‘stage 6’ of humanities ever changing demographic transition. Edward Morgan is a 3rd Year Human Geography student at the University of St Andrews, Scotland. *It has been suggested that the ‘top-up’ of population with immigrants has led to the return of the anti-immigration far-right in Europe and it has been used to explain the electoral successes of parties such as the British National Party, Front National (France) and the ultra-right wing Danish Peoples Party. Keith Montgomery does a good introduction to the demographic transition model. Paper by Mikko Myrskylä, Hans-Peter Kohler and Francesco C. Billari. Thompson’s Demographic Transition Model with stage 5. Submitted by xygwfl1122 on Tue, 01/20/2015 - 04:48. Submitted by majoin on Tue, 12/17/2013 - 00:23. Submitted by Importanceofeducation on Tue, 08/20/2013 - 10:03. It is quite good to be here to add some comments because your imagination regarding writing a powerful content is quite superb. We have an offer for you to learn About the MCAT through our online service and extend your knowledge for your future. We have a team of professional teachers which will guide you through regular processes. Submitted by almondcena34 on Fri, 08/23/2013 - 00:02. I like all the reviews have been posted by the visitors ofthis site ,some of them are very good suggested regard the article.This is really a fascinating blog, lots of stuff that I can get into. One thing I just want to say is that your design is so perfect.It is really nice to see the best information. Submitted by linksmega on Mon, 07/29/2013 - 03:53. In these days it is quite difficult to learn online by using some good quality website because writing needs some practice and good instruction from teachers. This is writing essays important for us to use some great plate from for that purpose. We are offering our outclass online services in the field of education. Submitted by john17nider on Mon, 07/08/2013 - 02:30. Submitted by john17nider on Sat, 06/22/2013 - 09:35. Submitted by davebarnes on Tue, 12/27/2011 - 11:12. "that immigrants tend to form insular communities in there arrival destination"
Submitted by Edward Morgan on Tue, 12/27/2011 - 12:26. Apologies, that one slipped through the net.